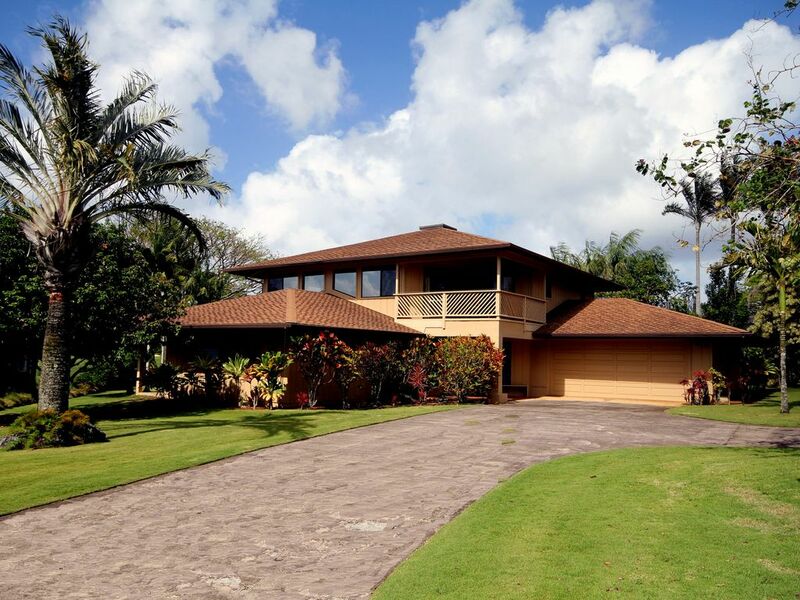 This Golf Course home is located in Princeville, home to some of Hawaii's finest resorts, golf courses, and restaurants. Princeville is also the site of three beaches, Pu'u, Kenomene Beach (Hideaways), and Kawweonui Beach (Sealodge). It is just minutes from Anini Beach, the funky town of Hanalei, and Hanalei Bay. The equivalent of three hotel rooms in a Princeville Vacation Rental on the Makai Golf Course, for less than the cost of one nearby hotel room. For three couples, each has the privacy of their own master bedroom with ensuite bath, and also the luxury of a large living area, looking out on golf course, mountains, ocean and waterfalls, to share with family or friends. For extended families, the house accommodates up to twelve, depending on ages and relationships. A large living area is just up the stairs of this spacious house which is almost 3000 sq ft under roof. Upstairs, enjoy panoramic views of fairways, mountains and waterfalls. Walk out on one of two decks, and enjoy fresh tropical evenings as the sun sets behind Bali Hai across the bay. King size beds in two of the bedrooms and two doubles in the third. A daybed in the Living Room. Two futons for extra guests or extra family. A crib for infants. Number of people the house can sleep comfortably depends on ages and relationships. Upstairs, a 'great room' of Living, Dining, and Kitchen areas, with windows all around, and two decks. Gorgeous views of mountains, waterfalls, and golf course. Directions provided in our own 'coffee table book' to all the best restaurants, snorkeling beaches and shopping, with sample menus and comments from past guests. A fully equipped kitchen large enough for three cooks to work in harmony, or walk to one of three nearby restaurants. Fully equipped with bed, bath and beach towels and linens, beach mats, and a library of paperbacks for that 'lie on the couch and do nothing' day. Books and toys for the 'little ones'. A DVD library of movies made on the Island of Kauai. You will have use of Sunset Drive Community Association Recreation Center across the street. This excellent facility includes a clubhouse, swimming pool and tennis court. Guests say: 'It's a beautiful thing when a place lives up to its billing' (The Nickels, Denver, Colorado). We have been told many times by our guests that it feels like home, not like a vacation rental, and that has been our goal. Shangri-la (n.) 1. A distant and secluded hideaway, usually of great beauty and peacefulness. 2. Princeville. Framed by sheer mountains that plunge into azure water, Princeville enjoys Kauai's most divine setting............................. as if the tranquil Hanalei Bay were in your own backyard. Robert Trent Jones's Prince course is a wild child, stretching 7,309 yards and often slashing its way through deep thicket. The Makai ('towards the sea') presents three nines -- the Ocean, Lakes and Woods -- that are more player-friendly. Playing early improves your chances of nabbing a patio table at the Living Room, where the sushi is always fresh and the sunsets are never less than dazzling. You Said It: It has everything -- ocean, mountains, waterfalls.... The most opulent resort I've experienced.... The lounge at sunset might be the most beautiful place in the world. We say that the house sleeps 12, but that is if six of the guests are couples or children sharing beds, two of the guests are children and can sleep on foam mattresses on the floor, and if one is an infant, sleeping in our crib. Retired Navy Captain Hank Drayton, and his son and daughter in law Rick and Debra share ownership. Rick and Debra, who live a mile away in Princeville keep the place beautiful, and Hank and his wife Gloria keep it full. Hank and Gloria live half time in San Diego, CA, and half in Kailua, Oahu. After I retired from the Navy, I worked for Rockwell International in Orange County, CA. One day I was stuck on the freeway in the smog, thinking to myself 'Why am I here in the smog, doing about ten miles an hour, when my son lives in Paradise (Princeville, Kauai)?' A week later, I called my son, Rick Drayton, and proposed that we get together, buy a lot in Princeville on the golf course, and build a Three Master Bedroom Vacation Rental. I had heard a Real Estate Agent there say 'I sure wish I had a three or four master bedroom house to rent!' So we did! And over the last 25 years we have enjoyed making about 650 sets of guests very happy that we did. Snorkeling, basking on the beach, gazing at the amazing scenery of the North Shore of Kauai. Sitting on the front deck watching the sun set behind Bali Hai. The landline telephone contains an answering machine. Spices.and other condiments are in the pantry. They are added to and used by guests, so no particular level is guaranteed, but there are usually enough to prepare a gourmet feast. Dining Room table seats 6. Three more at breakfast bar, and 8 more at tables on two outside covered decks. And a DVD library of movies made on Kauai. Hundreds of books - Hardback and soft. If you count the #1 fairway, the driving range and the #9 fairway, all behind the house, we have the biggest back yard in Hawaii. Various fins, masks, snorkels, boogie boards and surfboards are stored in the garage. Sunset Drive Tennis Court across the street. On the #1 fairway of the Ocean nine, Makai course. Children under 12 play free with an adult. Pool at the Sunset Drive Clubhouse, across the street.